The double drum rollers, manufactured by Wacker Neuson, are bitesize versions of the massive asphalt rollers one might associate with highway construction. The RD12 models, making a new home at Diggerland this year, are one-ton hydrostatic vibrating rollers featuring front drum vibration and articulated steering. 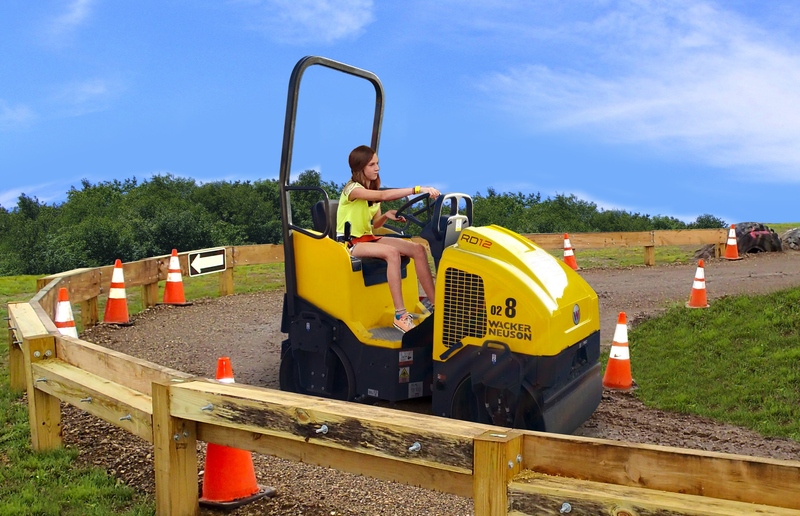 Read our full review of Diggerland USA in West Berlin, NJ. The Shake N’ Roll ride will become the 26th attraction at the New Jersey-based theme park, following the release of three attractions in 2015 including the ARGO amphibious vehicles, the WorkMax UTVs and the World’s Fastest Backhoe, the JCB GT. Guests can operate the new rollers on the Diggerland course as early as March 19th when the park re-opens for the season. Families wanting to get a sneak peak of the attraction can do so this week at the Philadelphia Auto Show where the roller will be part of a Diggerland exhibit featuring a number of the park’s attractions. The Philadelphia Auto Show takes place Saturday, January 30th – Sunday, February 7th at the Philadelphia Convention Center.